Owing to the wide experience of this domain, we are instrumental in offering Insulated Sandwich Panel to our clients. Our company has achieved laurels for providing PUF Sandwich Panel to the clients. Offered range is made using high quality material and is extensively used in the industries and households. PUF Sandwich Panel is available in several shapes and sizes in order to fulfill the various requirements of the clients. PUF Panel Systems are specifically designed to cater all kinds of Cold Storage, Telecom Shelters, Living Shelters & Clean Room Enclosures. The high performance and quality offered by these systems ensures extra strength, better overlap, weather tightness, corrosion resistance. Green Life Marketing Consultancy undertakes Field Marketing Service exclusively for your product. Our well trained field Marketing Executive will visit your targeted customers on daily basis, present your product catalogue, explain on your product and will generate genuine enquiries. We will follow up your each customer right from visitation to Order closure. - Various thickness Ranging from 50 -200mm. - Length up to 10, 000 mm. 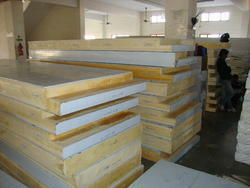 - Sheet Thickness as per customer requirement. We are leading manufacturer, supplier and exporter of Sandwich Panels, Sandwich PUF Panels and PUF Panels. We are instrumental in offering Sandwich Puf Panel to our clients.